The temple lovers, and the craftsmen that lived in: Malta up to some fifteen hundred years before Christ was born became fewer and fewer, some disease seems to have killed most of them or, perhaps, they died a natural death, The fact is that few of them were found when a new race of people came over to live here, It is, almost certain that these came from the shores of Sicily, and that they brought with them new ways of living customs religion, tools and crafts. They were rather different from the men and women who lived in these Islands before them, for it is quite clear that no new temples were ever built by them. 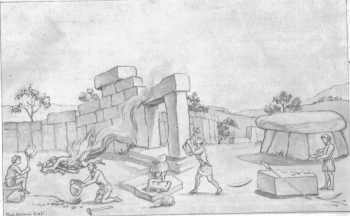 So far, stone had been used to make everything that was necessary for the inhabitants, but the newcomers brought with them something new that was to change the story not only of Malta but also of the world, they brought, metal a very important material for man. Probably, it was not difficult for these new people to overcome and defeat the old ones if there were any certainly, they had better and stronger weapons, arrows tipped with flint, daggers and axes made of bronze or copper. Their ability to make and to use metal enabled them, to have a new way of life. Besides these people had become sailors, or sea­farers, in order to visit all the Mediterranean lands from which they could get metals, such as copper and tin, with which to make bronze for weapons, tools, and other useful objects. To cut wood or the flesh and skin of animals, the people of those faraway times used flat metal axes it seems that they needed these to defend themselves from other invaders or from the people of nearby villages. Examples, showing how true this is. may be seen at Borg-in­-Nadur, near Birzebbuga and at Bahrija, some distance away from Rabat, Malta. As craftsmen, these new people became very good at working metal ware but lost the fine art of sculpturing stone and of making beautiful pottery. 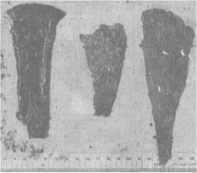 They made triangular daggers, with riveted handles of bone or hard wood, Some time ago, a sheet of silver and a lump of lead worked by the hands of these men were found (while some people were digging in a field) at Tarxien. When one of these people died, the body was not buried in the ordinary way it was cremated, This means that the body of the dead person was wrapped in linen or some other cloth, and then it was taken to the temple area, a big pile of logs and branches was prepared and the corpse was laid on top, then fire was put to the branches, and the body burnt completely the ashes of the dead person would then he gathered and put in jars that had various shapes afterwards, these jars were buried under the soil, together with some personal ornaments, weapons and sacred objects belonging to the dead person this custom was com­pletely new to Malta Sometimes, these people buried such remains under a few rough, upright blocks supporting a large flat slab on top. Such table-shaped tombs are called 'dolmens' the whole tomb was then covered over with soil and earth in such a way that only a high heap of rubble marked its position. All the information found on this web site is the result of a lot of research, from books I own dating back to the 1900's and other resources. All credit goes to the respective authors. If you think that I am in breach of any copyright, please contact me, and I will remove the material in question.